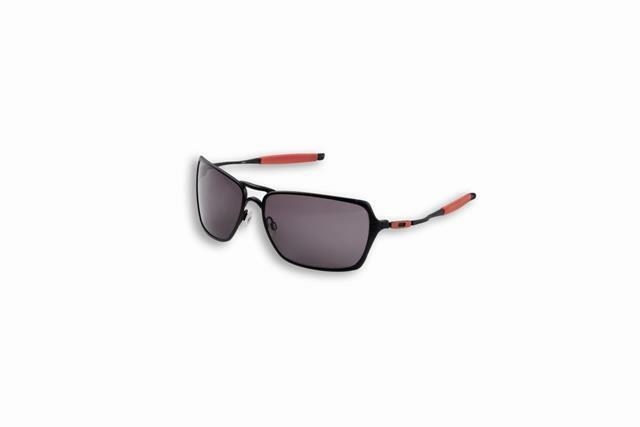 Oakley and Ducati continue their long-running collaboration in 2010 with two new sunglasses styles adorning the Ducati Corse logo. Finding a pair of Oakley's under a ton is difficult as it is, so these new Five Squared sunnies are perfect if you don’t want to spend over-the-top money for a pair of sunglasses. They have plutonite lenses to improve the impact protection if you’re wearing them as a riding accessory and also have a 100 per cent ultraviolet filter. The Five Squared retail at £86. These £161 Oakley Inmate are the sunglasses that you see Ducati MotoGP and WSB riders donning on the starting grids in blazing sunshine. The frame is an ultra-light metal and the lenses have a special curve in them to improve side vision and protect the eyes even from the side of the face.